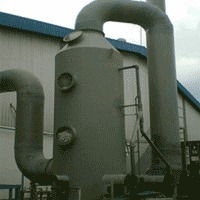 Gas scrubber is manufactured using ideal corrosion resistant materials such as polypropylene, PVC, FRP & others. We are into the designing, manufacturing, installing and servicing of an assortment of air pollution control scrubbers such as packed bed, counter current, spray or ventury cyclone and so on. These qualitative scrubbers are used to scrub hazardous gases such as HCL, CL2, SO2, NH3, various noxious acid and alkali fumes and many more.